I know, its a topic we’ve all heard enough about. But, this 30 second ad actually had me thinking. Whether you agree with it or not, I encourage you to take a look. If you lean anti-guns, what’s to lose? If you lean pro-guns, take a look and give it some thought. If you agree or disagree, share in the comments! I’ve been oddly quiet about this election. In the past, the mere thought of an election year, let alone one coinciding with the presidential election, would fill me with exuberance. I’d be lying if I suggested I wasn’t excited at first, though. 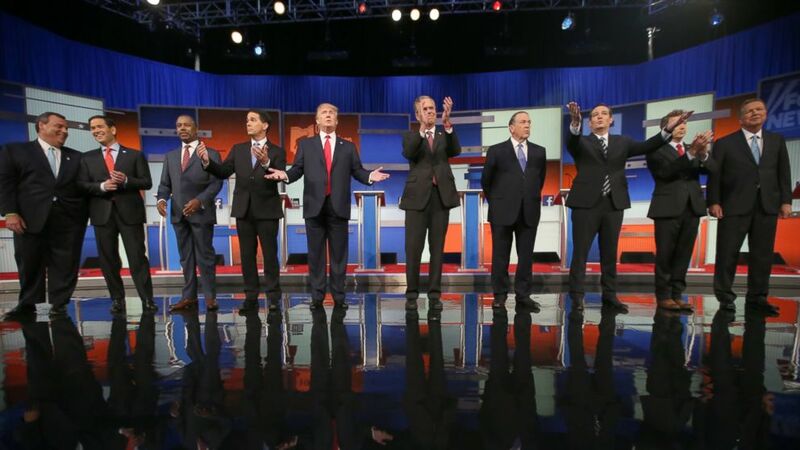 I sat down at my television a full half hour before the first GOP debate, overcome with tamed, but very present glee. That glee, however, quickly diminished. It became abundantly clear; the GOP is helpless. Get Your Billion Back, America! If you watch television, I’m sure that you have seen the new H&R Block commercials. Many find them to be interesting, while some think that they are offensive. One of these commercials, however, takes a very aggressive stance on a political issue that many find alarming. Take a moment to watch the commercial. Perhaps H&R Block is taking a facetious approach to military funding; “Oh, here it is!” Whether you are pro military, anti-military, or somewhere in between, chances are that you are fairly passionate about your stance. This is one of those “hot button issues.” But, perhaps we should take a moment to look beyond the typical mantra that surrounds this issue, and examine the specifics. In 2013, the United States spent more money on defense than any other country in the world. As a matter of fact, the country outspent the next nine countries combined. Now, this could be considered a great thing. Many people take pride living in a country which is undeniably the most powerful country in the world. But, I would like to propose a question. Lets take a closer look at the top 10 countries. 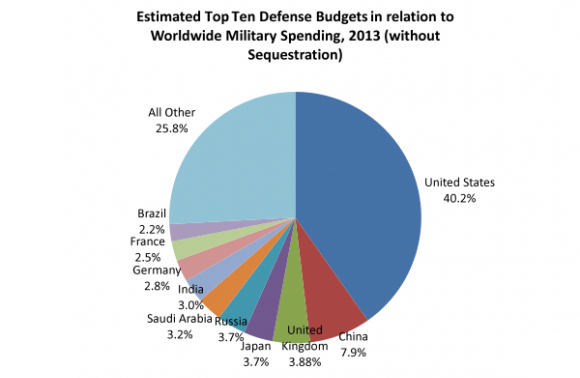 Is it necessary to outspend the next largest defense budget more than 5 to 1? Could we outspend them 4:1, 3:1, or even merely double every Chinese dollar spent on defense, and still reasonably assume that we lived in the most powerful nation in the world? The difference that we are considering is a savings of a number in excess of $300 billion a year. If you are not convinced by this, consider that within these top 10 countries, only two could be reasonably considered foes. 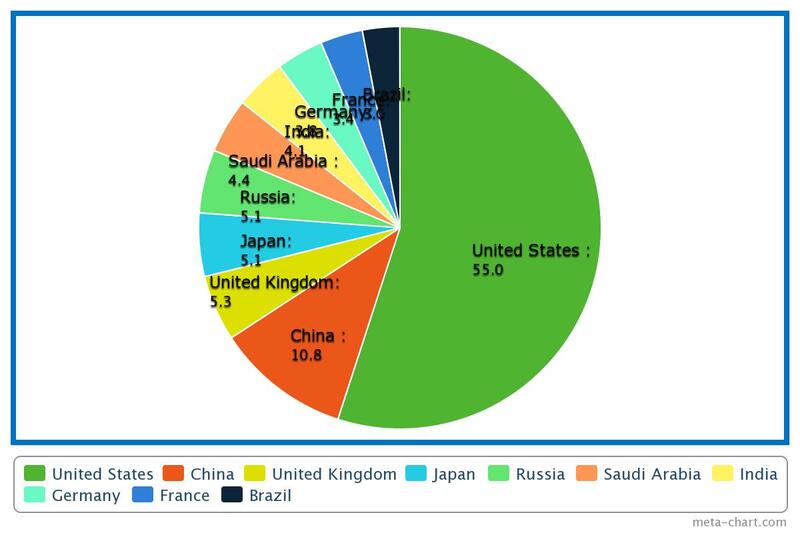 In an eight to two battle within the top 10, the United States and its allies outspend their foes 84.1% to 15.9%. To be fair, the United States has, in fact, benefited greatly in some of its past wartime efforts. World War II generated enormous amounts of wealth. But, long gone are the times of great wartime spoils. It would be tough to determine any economic benefits that have come from any of America’s recent wars. It used to be that the victor of war could pillage and plunder, taking what was his. But, this practice has now been replaced with expensive rebuilding efforts to get the defeated nation back on its feet. Military training, costly infrastructure repair, and economic incentives, all of which add to an ever growing military budget. If your social media is anything like mine, your feeds are filled with people complaining about “Black Friday” deals creeping into Thursday, Thanksgiving day. These people make a fairly strong point. On a holiday designed to give thanks for the things we already have, retail chains encourage us to lose our minds with consumer envy. This is quite a reversal of mindset. No matter how you feel about the actions millions take on Black Friday, it is an important day for many retail chains and our overall economy. “Black Friday” is a very specific name for what it has come to mean. It is the Friday in which many of retail stores come “out the red,” or out of debt, and “into the black,” or into profits. While you may not be privy to someone profiting from you, this is exactly what drives our economy. We live in a consumer economy that depends on people buying and circulating their money. Almost everything in the economy is driven by buying and selling. So, as you may or may not be making your trips into your local Wal-mart, Target, Best Buy, or whatever other store, take a moment to be thankful that you have the ability to do so. Be thankful you live in a country that gives you the freedom to do so, and that you have the extra capital to buy your new gadgets. Take a moment to be thankful for family and the people who have helped you throughout the year. Be thankful for your jobs and the food with which you have probably just gorged yourself. But, go ahead and buy. Buy within your means, but buy nonetheless. The economy will thank you for it. Most of all, have a Happy Thanksgiving! It has a scary sounding name: “Nuclear Option.” Not only does it sound bad, but it has officially been detonated by senate democrats. But, what is the “nuclear option?” What does it do and what are its implications? Traditionally, senate rules have, for almost all motions, required 60 votes to invoke “cloture.” Cloture is a fancy legislative term that simply means bringing an end to debate and moving on to the vote. Filibuster, in its simplest form is the delay or prevention of cloture. For much of Obama’s Presidency, democrats have complained, and perhaps rightfully so, that republicans have abused filibuster. The dissatisfaction with republican filibuster, as there has been plenty of cases to be dissatisfied, has led to the democrats detonation of the nuclear option. So what is the nuclear option? It is simply a rules change. Instead of requiring 60 votes to invoke cloture, it will simply require majority. As the senate has 100 seats, the magic number is now 51 votes. This, in essence, gives the senate majority all power. Instead of forcing the majority to garner the support, through debate, of some of the minority, or opposing view, to invoke cloture, the senate majority can invoke cloture on their own. There are many implications to this option. In the short-term, democratic nominees will have no competition from the republican minority. It will also effectively remove republican ideas and arguments from consideration, as their opinions will not need be heard in order to invoke cloture. These things are good, or bad depending on your political stance. Republicans will clearly be upset by the measure, while democrats, especially those fed up with republican filibuster, will be happy to clear the cogs of the political machine. Long-term, however, democrats will eventually face these same barriers, as it is highly unlikely that democrats will control the senate for the rest of American future. The second way in which republicans have answered the “nuclear option,” is the suggestion that democrats are simply trying to provide a distraction from the miserable roll-out of the Affordable Care Act, or Obamacare. While there is no way to tell whether this is true, as it is merely speculative, the only thing we can be certain of is that republicans have, indeed, used filibuster quite frequently in the Obama era. So what do you think? Is the “Nuclear Option” just a distraction from the ACA roll-out, or did republicans push senate democrats into a corner with their frequent and perhaps abusive use of filibuster? Sometimes, if I am honest, I struggle trying to find exactly what I want this blog to be. I try to be somewhat neutral, with mixed results. My blogs on gun control around the time of the Newtown shooting are an example of my shortcomings regarding political neutrality. Also, as a conservative, I can often be very harsh when disagreeing with the political right. When I take some time to think about this though, the goal of my blog is to make people, perhaps those that wouldn’t take the time otherwise, think about politics. I try to take current events and make them easier to understand. I try to take political formalities and explain why they happened the way they did. Most of all, this is what I want. Often times, when talking politics, people ask “Why don’t they just…” There is usually a very good answer to these questions, but without a general knowledge of politics the answers seem so straightforward. Say, perhaps, that you are on the pro side of gay marriage. Why doesn’t congress just legalize gay marriage? It seems so simple. That would solve the problem. But, it isn’t that easy. To understand how our government works, you have to think of each state as its own country. That is exactly what they are. They are 50 independent countries that have come together under one governing body, with the intent to protect one another from invasion or attack. The constitution describes the powers that these independent countries retain, and the ones to give up to the federal governing body. One of the powers the states retain is marriage laws. Congress is a part of the federal body, and therefore can not make any laws regarding gay marriage because laws regarding marriage are delegated to the states. It is easy to assume that most of these politicians lack the intelligence to get what they want done, but whether we agree with them or not, they know how the system works. Any time you may find yourself saying “Why don’t they just…,” it is probably because they can’t. I say all of this for one purpose. I enjoy writing this blog. It keeps me involved and informed. I have learned a great deal from this experience. I want to keep learning as well. So tell me, what do you want to read about? What current events? What philosophies? Let me know in the comments, either here or on Facebook, and I will do my best to write about them in the coming days!